About five years ago, many thousands of television viewers told the Sci-Fi Channel, "No, don't cancel Farscape! Farscape is the best thing you have! If you cancel it, you're going down a bad road! Who knows where it will lead?" But they didn't listen to the fans, and Farscape was cancelled. And now Bonnie Hammer, president of Sci-Fi Channel then as now, is trying to rationalize the Sci-Fi Channel airing WWE wrestling shows. That's in addition to the channel already showing the soap opera Passions (!) and reruns of Law and Order: SVU (!!!). We tried to warn them, but they didn't listen. Now they're broken. Cartoon Network, you're next. I'm sorry, but other than a surprisingly decent Superboy, these guys look terrible. I assume they were trying to capture some of that rakish Teen Titans quasi-anime mojo but instead they took a left turn and veered off into Ugly Town. 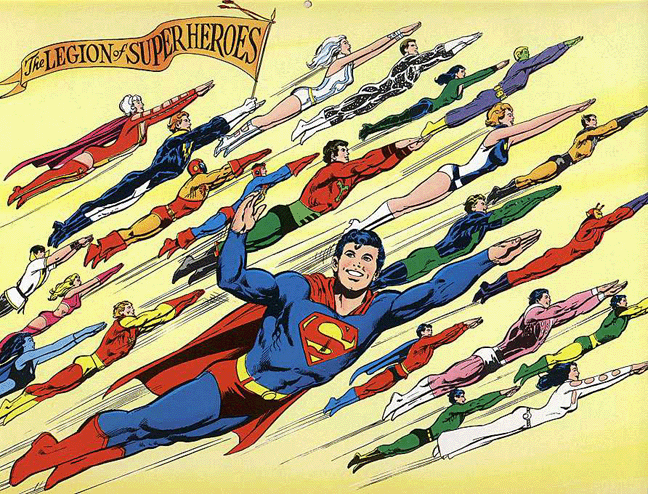 For that matter, you have to wonder how the cartoon will get away with featuring Superboy so prominently, in the wake of the recent court ruling that the television series Smallville may infringe on the copyright held by his creator's wife and daughter...and that show doesn't even refer to the character as "Superboy." So wouldn't the same concerns over possible copyright infringement apply here? DC only just got finished getting rid of the two remaining characters they had named Superboy, and the current Legion comic now features Supergirl. Personally, I don't understand why the different divisions at Warner can't coordinate their activities a little better: either have a "Legion of Super-Heroes" cartoon without a Superboy or Supergirl...or, better still, make the cartoon "Supergirl and the Legion of Super-Heroes" for greater consonance and cross-promotional possibilities with the print version, not to mention a girl-positive lead character. I wasn't planning to write anything special for Mother's Day, but this post by Ragnell inspired me to make a quasi-political statement about my mom. My mother turned seventy-one nearly a month ago. The most recent comic book she read was the latest issue of All-Star Superman. She liked Watchmen a lot. (I've told her League of Extraordinary Gentlemen is much superior among Alan Moore's work...but adult-onset diabetes has messed with her vision and she needs to get new corrective lenses before she's ready to tackle any more text-intensive Moore comics.) She was a fan of The Tick before I'd ever even heard of it. Sure, these days I recommend comics to her that I think she'd enjoy...but I didn't introduce her to comics. She was reading them back in the Forties, and was a big fan of Captain Marvel. When DC first revived the character in the Seventies, I read the copies she bought, not the other way around. I should add that she bought them so my dad could read them too. Before he became a surgeon, he had wanted to be a cartoonist, and avidly read comic books and comic strips. In subsequent years he did all the illustrations for his own medical papers. Neither parent discouraged me from reading comics, any more than they discouraged me from reading their collection of Kurt Vonnegut novels when I was nine years old, or any other books I wanted to read. Both parents borrowed my comics. So, that's my mom: geneticist, cell biologist, medical school teacher, left-wing political activist, science fiction geek, fan of Farscape and Doctor Who and Deep Space Nine, Usenet addict...and superhero comic reader. Erik Larsen will just have to deal with it. I haven't had a lot of time for blogging lately, but somehow I had the time to get involved with this discussion thread at digitalwebbing.com, a combination sounding board/workshop/support group for aspiring comics creators. If you're one of those people who thinks you'd like to work in comics someday -- statistics show that 99% of comic book readers want to become comic book professionals, and I can vouch for that figure personally because I just made it up -- you could do a hell of a lot worse than checking out this site. I only wish it had existed twenty years ago...but back then I wouldn't have been able to process and accept the information it offers. Anyway, this particular discussion thread led me to make some lengthy comments, and I'd like to repost them here for the benefit of anyone in the wider audience who might be interested. What follows is an edited jumble of comments from the thread; if you'd like to read the whole thing in context, follow the above link. The thread is about seeking tips and advice on the best way for aspiring comics creators to approach editors and publishers at conventions. The non-comics person may need to be told here that unlike prose writers or Hollywood screenwriters, creative talent in comics do not have agents representing them. Being the lowest of the low end in periodical publications, comics operate on the basis of creators making pitches directly to editors...and most publishers have become -- or are in the process of becoming -- closed, invitation-only clubs. You don't even get to pitch to Marvel or DC; they invite you to pitch, and then only on the basis of a proven track record or an existing social relationship. The original poster on the thread cited a literary agent who determines whether or not a writer has something to offer simply by reading the first paragraph. Surely comic book editors can do the same? Well, sure, I understand that perspective. It's the American Idol effect: people's innate capacity for self-delusion can be truly staggering, and it doesn't take more than a couple of flat notes for Simon Cowell to work out who might be a promising contender and who has no business even singing in the shower. We can leave out anyone who writes in crayon, or has major spelling or grammatical errors on the first page, or doesn't know how to format a readable script and it doesn't change the fundamental point I'm about to make. Here's the thing about writing: loads of people can write a killer paragraph. Especially if they're novices with no deadlines to meet and with years and years to hone and refine that killer paragraph. Only a small percentage of the people who are talented with words have the tenacity and determination to write every day, even when no inspiration strikes, to keep going in the face of every setback and discoragement...to actually be steadily working writers. Talent has very little to do with the capacity to do that work. In fact, talent can be an imediment -- if it means that writing comes so easily to you that you never had to learn how to work at it when it doesn't come easily. The catch is, only the people who are capable of sticking it out and getting the work done regularly and consistently are worth an agent's or editor's time. They've got deadlines to meet and books that have to be delivered and (at least in the prose world) advances that have to be justified. So many people come along and seem promising and talented yet who fold under pressure or flake out and don't deliver the finished work. In books, that means not only this book, but the next one and the one after that. In comics, that means not only the script you've finished, but next month's script and the month after that. These people are investing in your future output and they have to take a gamble on your ability to perform...and they still get burned time and time again. This is why self-publication has become a big feature of the comics landscape and will only become bigger in the future, especially for the aspiring newcomer. An aspiring writer handing an editor a finished, printed comic book at least says "I'm determined enough to make it in this business that I did all the extra work besides writing necessary to make it happen, I pulled it together and could coordinate with at least one other person -- the artist; possibly more than one if there was an inker and letterer -- and I nagged them about deadlines and kept after them and still made them want to work with me. And here's the proof right in your hands." This goes a long way to showing an editor that you're someone who can and will do the work of being a writer. It also helps show them that what you want to do is make comics, not "be a comics author" or whatever. The person who does comics because he or she has to -- who does the work for the sake of doing it and getting it seen by others -- is a MUCH better gamble for a publisher than someone who's only interested in doing it if certain conditions are met. A finished printed comic says "I did whatever it took for people to see this story, because I had to. If you don't publish me, people are still going to see my stuff." If I were an editor, that's who I'd want to work with. But there are so many aspiring writers and artists! There are more working writers out there, already published, than the industry can support as it is. And why bother when even the most successful comics writers could probably be making better money, working under better conditions, writing copy at an ad agency? If you compare writing comics to writing copy at an ad agency, then yes, the supply outstrips the demand for the former, and the latter is far more lucrative. But you could say the exact same thing about being a painter and painting signs. There are far more painters in the world today than are needed, strictly speaking in terms of the number of paintings that anyone can look at in a lifetime. The guaranteed income of a regularly working sign painter may be much more useful in supporting a family than that of a starving painter in a garret. Novelists? No one can get through the smallest fraction of novels published each year. Musicians? It's even worse. We can say the same about film and television. So, in ANY field of art, a person had better be doing it for sheer love of doing it. In that sense, there's no more reason to discourage someone from creating comics than there is to discourage people from writing novels, painting paintings, making music. They're all equally "fruitless" in terms of strict supply and demand. But art doesn't work in terms of supply and demand, either. Good art creates its audience. An artist is not filling an existing demand for something that doesn't exist; the artist gives the audience something they didn't know they wanted until they saw it. If there were no Grant Morrison (one of my favorites, but you can substitute your favorite writer or artist here) my comic book purchases wouldn't simply transfer to someone else. I buy a new Morrison book if I see it; if there isn't one, that's one less comic book I buy. And this is the reason why editors are looking for new creators at all: not because they have an opening on their schedule, but because they hope to find another Grant Morrison who will create a new audience they otherwise wouldn't have. Note also that Grant's first published comics work was in 1977. It can take a while for a career to happen. I don't think anyone would argue that Grant should have given up much sooner? We are competing, in the Darwinian sense of so many new comics wanting to catch the eyeballs of a potential audience. Breaking through that is hard. Doing something that justifies getting this attention is hard too. But a Grant Morrison or a Brian Bendis or whoever is not our competitor. They created an audience. We have to create one too. My goal is not to take away one of Grant's readers, but to work and struggle and pray for that day when someone tells me "I bought two comics today -- yours and his." In the movie An Inconvenient Truth Al Gore uses a clip from Futurama to illustrate global warming. That man is my President. I've been busy lately doing preliminary research for a new writing project. That's always the best part, when I can indulge myself learning a ton of stuff about the history of railroads, diagnostic indicators of cerebral hemorrhage, trees native to Pennsylvania, and the Ramayana...and saying to myself "I'm not goofing off, it's research." Then comes the other good part, which is staring off into space and letting it all swirl around in my head...and saying to myself "I'm not goofing off, I'm developing a story." And then comes the part about typing it all out, cursing myself for having no talent, waking up at 4 AM and deciding to quit writing...the usual. But at times like these, the blogging gets shortchanged. It's unavoidable. It doesn't mean I don't love you. Now, if you're anything like me...first of all, please seek help immediately. Even though I make it sound fun and glamorous and exciting, it will only end in tears. But I digress. If you're anything like me, you've spent the last few days reading endless commentary and analysis of Steven Colbert's appearance at the White House Correspondents Dinner on Saturday. It's become an obsession with me. I was jazzed to see the real thing live on television, but the aftershocks have become overwhelming. All the commentary after the fact can be summed up in this simple formula: If he was talking about you, you didn't think it was funny. Fortunately, one person has provided a comprehensive, sensible, and well-informed analysis of the event and subsequent reactions to same on his blog. And no, I don't mean Johnny Triangles. I refer to stand-up comedian, physicist, screenwriter, and comic book author John Rogers, who writes about Colbert's performance here and here. Anything I could say on the topic has already been said in those two posts and in the comments section for each. Besides, anyone who knows why the words "Vaughn Meader" were once the funniest joke ever told has my respect.